M7424 - Gold Painted Carved Wall Plaque for Marine Corps MCAS Chery Point Training Facility. 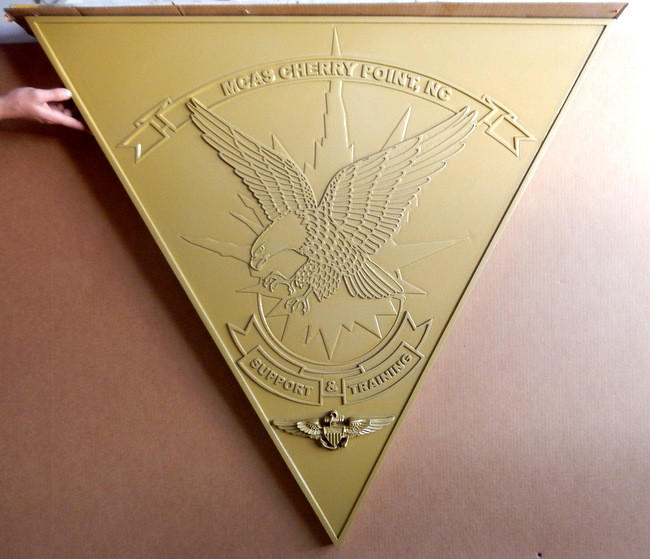 Shown above is a metallic-gold painted 2.5D (with 3D wings badge) carved High-Density-Urethane (HDU) wall plaque, for the US Marine Corps Cherry Point Training Facility. This plaque is 40 inches in diameter, but can be purchased in any size from 16 inches to 60 inches in diameter. It can also be customized with other text, including a Congressman's or Committee name, or other artwork. We make custom & personalized metal-coated round, rectangular, shield, and other shape wall plaques of all of the great seals, emblems, logos, badges, medals, insignia, and patches for any branch, department, agency or other organization of the US Federal, State, county and city governments, the military, and their various departments, agencies, units, etc.,, as well as professional offices (attorneys, doctors, CPAs, etc. ), colleges, companies, stores, cemeteries, memorials, churches, and residences.